Melbourne won the inside 50 count 173 in the last quarter and generated 11 scores to one. Melbourne has now scored 20 points from 22 intercepts in the forward half. Melbourne leads the clearance count 64 this quarter and it has generated four scores from this source including the last goal. The Demons have now won 19 intercepts in the forward half, one more than they averaged in 2015, and have scored 13 points from them. The Demons won 11 of the last 14 clearances in the third quarter but both teams generated two scores from this source. Mitch Honeychurch is up to six score involvements including two goal launches, both from intercept possessions. Josh Dunkley has won an equal gamehigh five intercept possessions with his last launching the Dogs' fifth goal from intercepts. Melbourne InterchangeTom McDonald off due to an injury. Max Gawn has won eight hitoutsto-advantage with two of these launching goals for the Demons. No other player was won more than one hitout-to-advantage. Jack Watts is up to a gamehigh six score involvements, two more than any other player. The Dogs have won the only five clearances this quarter and the last six of the game. The Dogs have now won 11 of the last 15 clearances with the last, won by Will Minson, launching their second goal from this source. After applying 53 more pressure acts than the Demons in the first quarter, the Dogs lost this count by seven in the second quarter. The Demons finished the second quarter well. In the last 10 minutes they generated three forward 50 entries from three chains originating in the defensive midfield and kicked two goals from them. They won the effective kick count 199 during this period. The Demons have kicked the only three goals of the quarter, all from intercepts. Melbourne InterchangeColin Garland off due to an injury. Jeff Garlett is up to five disposals this quarter as well as kicking the last goal, one of a quarterhigh three score involvements. Melbourne InterchangeTom McDonald replaces Lynden Dunn and is possibly out for the game. Bernie Vince wins an intercept possession in the defensive midfield and launches the Demons first goal from intercepts. The Dogs have recorded 29 more disposals, including 16 more effective kicks, than the Demons this quarter. The Demons have generated eight forward 50 entries and just one score from 24 possession chains originating in the defensive half. The Dogs lead the effective kick count 174 this quarter. The Dogs applied 25 more pressure acts than the Demons in the forward half in the first quarter and generated three goals to none from turnovers in this zone. 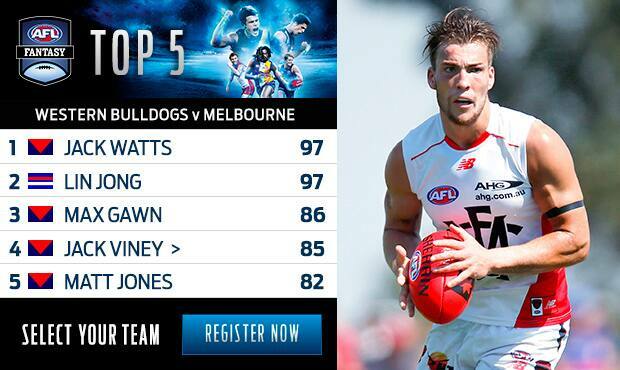 Despite winning five fewer clearances than the Demons, the Dogs have generated one more score from this source. The Dogs have won three intercept possessions in the attacking midfield and booted a goal from all three. Melbourne InterchangeSam Frost off due to an injury. Ben Kennedy recorded the second highest scoreboard impact (18 points, including two goal assists) for the Demons against the Power last week. His second disposal today was his third goal assist of the preseason, two more than any other Demon. The Western Bulldogs have scored both their goals from three possession chains originating in its attacking midfield. Melbourne has failed to generate a score from three possession chains originating in the same zone. Nathan Hrovat is up to five handball receives. No other Dog has recorded more than one. The Demons averaged 18 intercepts per game in the forward half in 2015, ranked 15th in the competition, and they scored 25 points per game from this source, ranked 14th. 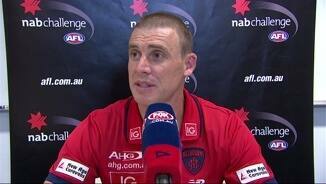 Last week against the Power, the Demons won 25 intercepts in the forward half and scored 43 points from this source. Welcome to Highgate Recreation Reserve for the Western Bulldogs v Melbourne Round 3 clash. MELBOURNE has overrun an inexperienced Western Bulldogs line-up to remain undefeated in the first two rounds of the NAB Challenge. In blustery conditions, Melbourne kicked four goals with the wind in the last quarter to win by 12 points, kicking 0.10.12 (72) to 1.7.9 (60). The Western Bulldogs did not kick a goal into the wind in either the second or last quarter. However, the day was a positive one for the Bulldogs, with star midfielder Tom Liberatore making a successful comeback from a knee reconstruction that forced him to miss last season. They also gave seven of the eight players that joined the club in the off-season a taste of senior action, with free agent Matt Suckling the only new player to miss. Josh Dunkley was impressive and Bailey Williams kicked a nice, long goal in his first game. Jack Watts was lively up forward for Melbourne, kicking three goals in the absence of key forward Jesse Hogan, while 18-year-old midfielder Clayton Oliver once again pushed a strong case to be included in round one against Greater Western Sydney with 17 disposals. Jack Viney was his usual industrious self while Nathan Jones, who had neck surgery in the off-season and then hurt his knee a month ago, and Bernie Vince will be better for the run. Small forward Jeff Garlett also looked dangerous and promises to build on his impressive performance last season when he kicked 40 goals. Coach-in-waiting Simon Goodwin said it was good to get the win in tough conditions and the last quarter was outstanding. "They're showing a bit of fight and grit and resilience with the way we play, so that was really pleasing," Goodwin said. "We recognise the Bulldogs played a pretty inexperienced team but we're really focused on how we're going about our footy. Contested ball was a bit of a highlight. We played pretty well in that area for most of the day (Melbourne won the count 130-119). Some of the things are not quite ingrained in the way we want to play yet but that will come." The Bulldogs decided to give Robert Murphy, Dale Morris, Matthew Boyd, Jake Stringer, Marcus Bontempelli and Jack Macrae a rest, but they intend to play close to a full strength team against Collingwood next Saturday. That side will give an indication of the Bulldogs thoughts ahead of their round one clash against Fremantle. The 23-year-old Liberatore had 16 disposals and showed a glimpse of the future in the second quarter when he rifled a pass off half-back to a leading Tom Boyd that eventually led to a shot at goal from first gamer Dunkley. Big Boyd showed his potential when he took a screamer 12 minutes into the third quarter, but he missed the set shot to bring his tally to three behinds for the day. 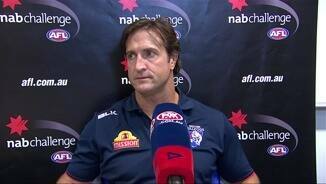 Western Bulldogs coach Luke Beveridge said he was pleased with the performance. "When you are a sniff to win you always like to win. We were rapt with what some of the new blokes did and our experienced guys and their leadership. It was a terrific effort," Beveridge said. Melbourne: Max Gawn is vital for Melbourne in the opening rounds with back-up ruckman Jake Spencer sidelined with injury. Thankfully for Demon fans he is in good shape and form at this stage. The Demons are also heavily reliant on young bookends Jesse Hogan (who did not play) and Tom McDonald. 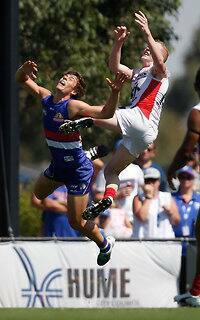 Both provide aerial power, an area Melbourne battled in against the Western Bulldogs. Nathan Jones is fit and ready to go and Jeff Garlett could be a surprise packet if he receives enough supply. Western Bulldogs: To only lose by two goals with 14 of your best players missing was a credit to the system Luke Beveridge has developed in his short time at the Bulldogs. The team not only has a deep list, it looks organised and plays like a good team. Tom Boyd missed a few opportunities to kick goals but he is very good in the air and is shaping well, while Jack Redpath has the grunt to be a good target and foil inside 50. Tom Campbell could also address ruck concerns although Will Minson is still serviceable. Melbourne: Clayton Oliver backed his good game against Port Adelaide with another impressive effort. Sam Frost did enough up forward to suggest he has a role down there after having his 2015 ruined by injury while Josh Wagner was used sparingly. Tom Bugg was impressive and looks a certain starter for round one. Western Bulldogs: A raft of new faces had their first hit-out in a Western Bulldogs jumper and none looked out of place. Josh Dunkley's interceptions were a highlight, while Bailey Williams kicked a long goal. Brad Lynch found the ball well with 13 touches. Jed Adcock was in all the tough stuff, showing his experience, and mature-aged recruit Marcus Adams has the perfect build for a defender. Poor Luke Goetz didn't get a touch during 14 per cent of game time but tried to exert a physical influence, and Declan Hamilton had five touches in just 17 per cent game time. 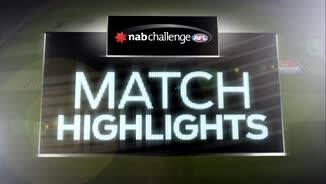 Melbourne fronts up against St Kilda for the Sunday twilight game at Etihad Stadium with the Saints desperate for match practice after the cancellation of their NAB Challenge game against the Brisbane Lions. The Western Bulldogs will pick a full strength team for the game against Collingwood as it prepares for the opening round against Fremantle.